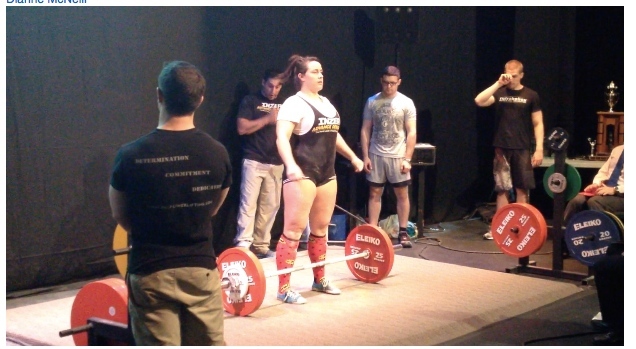 Home Dianne McNeill Blog PostsLocal Powerlifter Breaks Records and Brings Home Gold! McPay hit two of the three Back Squats successfully “I missed depth on my second lift due to a slight wardrobe malfunction, but went into the back and with the support of my coach Phil Howe, got my head back in the meet. After sorting out my singlet, I went back in, squatting full depth and then some”, McPay laughingly reports, coming in 5 kg short of a provincial record, finishing with 115 kg. In the final count, her total weight raised was 343.5 kg., beating the old provincial record of 305 kg by a whopping 38.5 kg. “All in all I had a great weekend, with some amazing lifters, and I am overwhelmed and thankful for all the support of everyone at the Meet, CrossFit O`Twelve, Langley`s Hybrid Athletics and Courtenay`s Titanium CrossFit. This was an amazing showing for an athlete relatively new to the sport of Powerlifting! McPay states she is looking forward to training for the next Meet, and has some serious goals in sight which include qualifying for the National Powerlifting Competition next spring.